The William P. Holliday Forest & Wildlife Preserve is a 580-acre (give or take a few) passive recreation area in Westland, Michigan, a western suburb of Detroit. The Preserve is a linear park that runs along Tonquish Creek (the green area at left). It was established in 1964 by Arthur Richardson in honor of his uncle for whom the Preserve was named. Now I have an interest in history and am a member of the Holliday Nature Preserve Association, a volunteer group that gives hikes, hosts clean-ups and works to improve the Preserve, so my interest is personal. In addition, I edit our organization’s newsletter and run its website. The other day, I ran across several articles on the history of the Preserve. Apparently Richardson, who was born in Michigan, but moved to New York where he died in 1938, established a trust that left much of his estate to Wayne County. There was a catch however: The county would need to establish a park in his Uncle William’s name and ensure it remained unspoiled so as to give people an idea of what Wayne County looked like in the mid-19th century. The gift Richardson offered the county amounted to $1.445 million. That was a lot of coin 50 years ago and county fathers took it, although they knew doing so would remove a large portion of Nankin Township (now the city of Westland) from development. Plus, although Westland is now one of the state’s largest cities, 50 years ago the area in question was heavily wooded and located in a township that had, at least then, a surplus of undeveloped land. 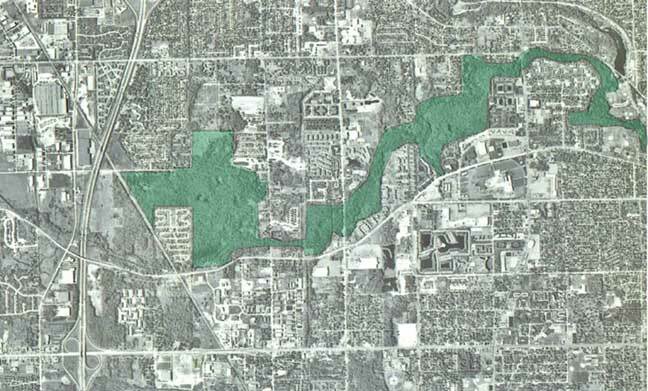 It wasn’t until 1958 that the bequest became before the county’s Board of Supervisors, who approved it, and began to purchase land along the Tonquish Creek, a tributary of the Rouge River, for a Preserve. Plans at the time called for six shelters, 70 camp stoves, nine council fires, 17 pedestrian bridges, six parking areas, 2.5 miles of service drives and 10 miles of nature trails. It would take much of a decade for the land to be purchased or taken through the process of eminent domain, and the work completed, though plans were scaled back considerably by the time the Preserve was dedicated on July 2, 1964. One interesting tidbit. Apparently Richardson, who was born in the downriver city of Wyandotte, used to take hikes with his uncle in the woods and fields of Wayne County; however, it seems Richardson never visited Nankin Township and the area that would ultimately become the Preserve thanks to his generous donation. Just as spending time enjoying nature with his uncle made a lasting on Richardson, the experiences visitors to the Preserve share with their children might do the same. And we think Arthur Richardson would like that.